How would it feel to wear the uniform of the Israel Defense Forces? The Israeli army is an integral part of Israeli society and its presence is felt everywhere in the country. It is difficult to know Israel without an understanding of the army and how the State of Israel defends itself. This track offers you the opportunity to truly immerse yourself into Israel through gaining an understanding of the military from within. 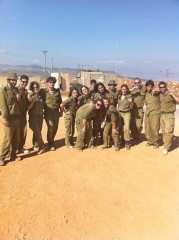 Experience Israel like an Israeli through the Marva army program which enables you to become integrated into the army for two months as you learn basic military skills including weapons training. Through the Israeli Military program, you have the chance to gain a deep understanding of this central piece of Israeli society. Due to the 8-week Marva schedule, academic courses for credit are not offered to those choosing this add-on track. Marva is an army-simulation program designed to give you a feel for what life is like in the Israel Defense Forces. The program is run in cooperation with the Israeli Army and the Jewish Agency. This co-ed program will have approximately 150 participants ages 18-28 from all over the world including our Aardvark Israel participants. In Marva you will wear an Israeli army uniform, carry a gun and learn survival skills, field training, self-defense, topography, navigation, and more. You will meet Israeli soldiers while hiking and touring throughout the country. During the Marva period, you will be in the army and spend some weekends at home in your Aardvark apartment. Each student is required to apply and be accepted to the Marva program (acceptance is within the sole discretion of Marva and is based on Aardvark’s recommendation combined with the participant demonstrating that s/he is both physically and mentally well and has no prior history that may prevent the successful completion of the program). Please note, the army requires that all male participants arrive on the opening day of Marva with a very short haircut. Week One: Introduction. This week will be spent in the home base of Sde Boker becoming familiar with army discipline and codes, learning first aid and topography and basic information about the IDF. In addition, participants will undergo weapons training during which they will learn how to use an M-16 rifle, and at the end of the week they will experience their first shooting range and first march/hike (approx. 5 km). Shabbat is spent on base. Week Two: Field Training. This week will be spent outside of the base in field conditions (no bathrooms or showers!) Participants will learn how to be a soldier in the field through lessons on topics such as camouflage, ambushes, training exercises and survival training in both day and night. Shabbat is free. Week Three: Negev and Navigation Week. Throughout the week there will be a variety of activities in the Negev area including a visit to an infantry base, a joint exercise with the soldiers there, and intense walking. At the end of the week Marva soldiers climb Masada at sunrise. Shabbat is spent on the base. Week Four: Galilee/Golan Week. During this week Marva stays at a base in the north. Participants have the opportunity to tour around the north, including the border with Lebanon. Week Five: Sport. This week is spent on an army base. There, participants undergo intensive physical training including fitness, obstacle courses, self-defense and more. Shabbat is spent on the base. Week Six: Women in the Army/ Infantry week. During this week the men and women will be separated for the first and only time in the program. Shabbat is free. Women: The week will be spent visiting several army bases and learning about the opportunities for the female soldier in the IDF. Men: The week will be spent doing infantry training at a base in the South. Training includes learning to use heavy weaponry as well as group exercises. Week Seven: Jerusalem week. This week is spent learning about the three different religions in Jerusalem and exploring the old and new city. The weekend is spent on base. Week Eight: Summation. This week is dedicated to ending lessons and discussions, a final 18km march, and a military graduation ceremony. If you have ever undergone an operation or if you have or have had any chronic diseases, a letter is required from your treating physician stating that you are capable of participating in the Marva program.